Individuals suffering from borderline personality disorder need your help! There is a substantial gap between the increasing demand for skilled care by people with borderline disorder and the availability of clinicians who are able to provide it. The gap is the result of the interaction of a number of factors resulting in a “perfect storm” of underserved patients [Early Sea Changes in BPD]. The rapid increase in demand for treatment has been generated primarily by three events: 1) the doubling in the past decade of research articles on all aspects of borderline disorder. 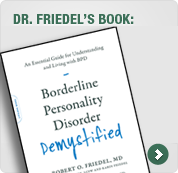 In part, these articles have further confirmed that BPD is a valid diagnostic entity with a 60% level of heritability and can now be effectively treated with the combination of medications and psychotherapy as described in this website; 2) the recent dramatic increase in the publication of books and websites, and the broadening availability of seminars on borderline disorder available to the lay public; and 3) the widespread distribution and use of this information by advocacy organizations, such as the National Educational Alliance for Borderline Personality Disorder (NEA-BPD), the Treatment and Research Advancements Association for Personality Disorders (TARA APD) and the National Alliance on Mental Illness (NAMI). The main factors that have limited the supply of clinicians experienced in the diagnosis and treatment of borderline disorder are: 1) a long-standing and persistent cynicism about the validity of the diagnosis of borderline disorder, especially in adolescence, and nihilism about its response to treatment; 2) the clinical challenges often presented by this population of patients; 3) the lack of adequate education about borderline disorder of many clinicians now in practice who trained before the new data became available; and 3) the failure of many health care insurance policies to cover the treatment of personality disorders. Most academic departments of psychiatry in the United States still have no clinical training programs in borderline disorder. In the past, chairs of these departments would have responded to this situation by committing significant new resources to this area. However, in the current restrictive financial climate, such resources are difficult to mobilize. Some early signs of improvement in this area are appearing. In addition, most individuals with BPD suffer from one or more co-morbid Axis I disorders such as Mood Disorders, Anxiety Disorders and ADHD, thus justifying the treatment of BPD to manage effectively these disorders. Although there are an increasing number of educational experiences about borderline disorder for practicing clinicians and those in training, it is likely that the existing imbalance between demand and supply will persist until these educational activities can be significantly expanded and reimbursement for care enhanced. In the meantime, patients with BPD need your help. Systematically review the material on this website. It is essentially a primer on BPD and has been written so that the material flows in a manner that is intuitive and clinically logical. Begin at the left side of the green content bar at the top of the Home Page and examine the pages referred to on the drop down lists. You may wish to make a copy of each page to produce a readily accessible hard copy. The Resources drop down list will provide information on topics that you may wish to explore in more detail. Develop a small network of experienced colleagues with whom to collaborate. If you are a psychiatrist, especially focus on the main diagnostic issues and the uses of medications as we now understand them, and inform yourself about the main methods of therapy and the current evolution of this intervention. If you are a therapist, review the general principles of the use of medications so that your patients may benefit from them when indicated. Learn the current concepts of BPD-specific therapies. Fortunately, the field is rapidly evolving to a more readily understandable model of therapy that should be easier to learn and apply than the current alphabet soup of alternatives that are each limited in their focus. The Three Phase Model of Treatment described on this site may help you become quickly oriented to your main tasks. Be sure to carefully define the responsibilities of all treatment team members during episodes of crisis and periods of routine care. If possible, include critical family members and loved ones in the diagnostic and therapeutic process. A prominent symptom of BPD, and a leading cause of acute BPD crises, is the disruption of a critical relationship. It is important that everyday-problems in this area are anticipated and prevented when possible, and addressed promptly when they occur. If you have questions, contact me through the website Contact option or call me at my home office (804-744-5261). I am always eager to help.